Wonderful and spectacular with the sun shining,we do about 3 miles half into the gale, difficult, and blown back, easy. Elliott with two mates a reluctant whippet, and a hyper spaniel. In and out of the sea, the spaniel chases a found tennis ball and Elliott chases the spaniel. We found 3 abandoned balls and a golf ball and rather sadly the remains of a dead calf. Not much movement since coming home completely knackered. Rest and repeat tomorrow. One moment it says it is all over on Wednesday, Then it changes to Tuesday with a light breeze on Wednesday, Now it is back to Wednesday and Thursday has serious wind as well. March was always unpredictable. 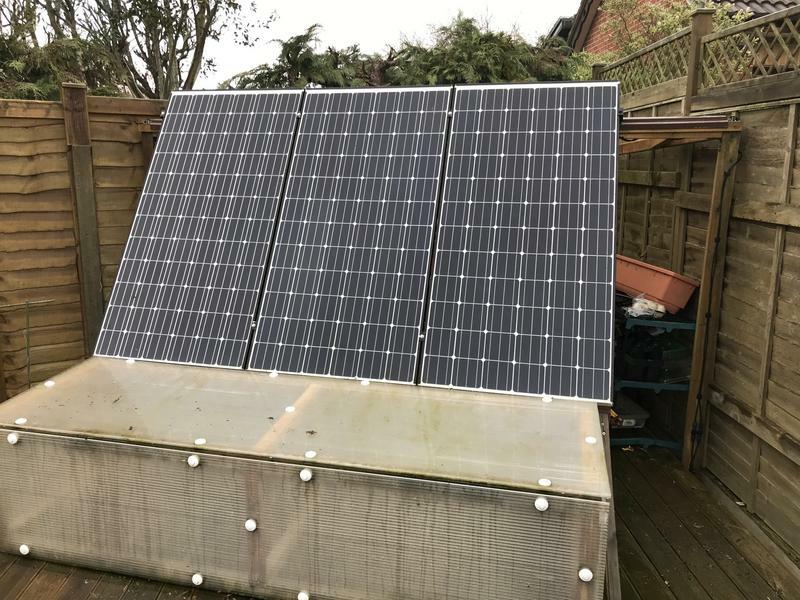 We Had everything coming at us yesterday and amid all the hail and snow our solar was doing astounding stuff in between the violent showers of 10mm hail stones that rattled the house to wake the dead. The one thing missing from all this was lightening..9 times out of 10 when we would have this kind of weather lightening was never far behind but this time ,,nowt so far. 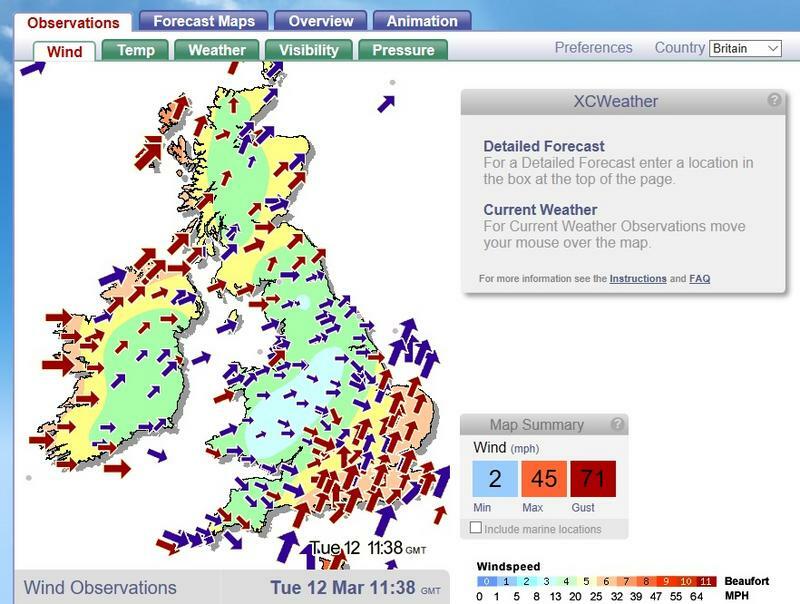 We should be getting blown all over the place. It is windy and wet with sudden hail squalls but no more than a force 6 so far. T,s house is right next to the red from noon till midnight. So it has not got going yet. At the moment we have bright sunlight with the PV sending the charge galloping into the bank. Typical March weather. The controllers are breathing hard but then they have been doing this for many years. Good luck everybody. South coast getting a kicking for a change. I was upstairs when I heard a crash followed by SWMBO shouting about Solar Panels. Ehhhhhhh, that does not sound good. OUCH !, that looks expensive. It was my own fault as I had kept thinking for the past couple of years that I needed to add more restraint to hold the panels in place but it was always tomorrows job. Incredibly no damage to panels or cables and an hour later we are back in business with additional restraints, and just before the rain deluge came down. Glad to hear you avoided any damage Nowty. It's scary stuff trying to secure them panels in the wind. That is nasty. You will hardly believe this but there is sand and gravel in that water. It will burn the grass and damage the grazing. It will stunt growth until the salt is washed farther down into the earth. I had a cousin who had a small twenty acre farm by the beach. When he woke in the morning after a particularly bad storm he was over 10 acres short. The land was still there but covered under thousands of tons of gravel and sand. It was the worst night he ever spent in his life. 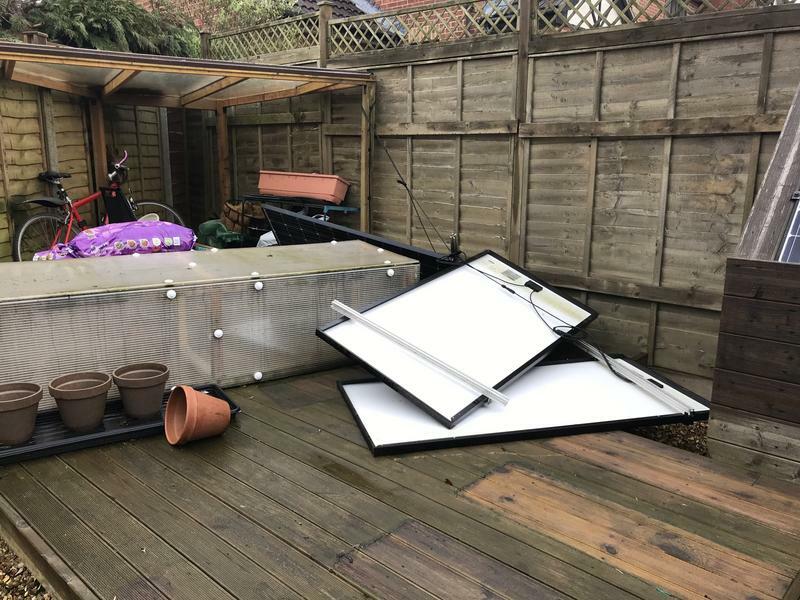 He and his wife and kids spent the night terrified with blasts of sand and gravel hitting their house, breaking the slates and windows facing the beach. Six weeks later he was on the boat for England. I was out with the lamp and Lady my little deerhound lurcher A bit of wind is good. Bunny will sit with his back to you sniffing into it and the lamp beam is hardly needed. That night I saw grass being rolled up like carpet and large 9" dallions being washed up onto the grass, rolling for 100s of yards across the warren. just like bowls. But the rolls of sod was a first time for me. I had got caught out and was sheltering down behind a group of large upright stones. Lady had begun barking at these rolls of sods that were mysteriously rolling back from the beach head and only coming to a stop when they bumped into the rows of upright stones near where we were sheltering. She was starting to panic and I put her on the lead because once she would get blown over , I feared that she would take off running and kill herself. She was quite highly strung. I had real difficulty getting back to my car that night and evening opening the door was a massive challenge.I only had a mile and a half to travel home but it was littered with broken branches. That would have been 1986 or thereabout but I thought I saw it all that night. There is wind and there is wind but thank god we don,t get many Hurricanes like Charlie. One of the side effects is the white foot deep foam that stays on the land for weeks and weeks. It must be the sea weeds being beat up and whipped up. It is very dirty and unpleasant. The storm whips it up further and carries it inland to stick to anything and turn dark after a few days. It was a great reminder that nature was boss. This same place was where i used to take my kids swimming. Beautiful white beaches and pristine water. peaceful and quiet, but not that night. Its been rough but not in that league. Nice story Bif, I think the scariest weather related moment I've ever had was walking up the access road to the main substation for the hotmill in Llanwern steel works, the wind was howling straight at us enough to have to lean into it. There was a hell of a racket up ahead and three full length sheets of steel cladding peeled of the mill roof , came down onto the road ahead tumbling end over end toward us, needless to say I'd never run as fast as that in my life before and, fortunately, after. Dallions are the large smooth stones that sit up at the top of the beach normally. You can tell if your coast is facing the rough side because the tide has been strong enough to lash them up high and strand them. We always called any smooth round stones over 50mm on the beach a dallion. There was a time about 30 years ago that loads of them were used in land drainage above and round the yellow perforated 4" pipe. Mostly the 50mm ones. Then the law made it a criminal offense. knew i wouldnt get time afterwards, and im glad i did. I see one of my trees lost a bough this evening, and that was before the storm really kicked off. hopefully we'll be back to just a nice windy day tomorrow. what's a 'dallion' Huh, is this the same as a Durling ? Still going hammers and tongs up here. Dallions are nice smooth round stone. Possible ashlar or granite. Durlings can be round and smooth as well until you put a ring on their finger.